Yesterday on a bright and sunny day I popped down to Aotea Square to see what the extreme right was up to. There had been a fair amount of social media promotion of the yellow jacket rally and I wondered what sort of turnout they would get. I had thought that there might be some interplay between the left and the right. Love Aotearoa had organised a migrant’s picnic nearby. Most people there were obviously having a good time and apart from a few activists that I know most people stayed away. The rally was underwhelming. There were maybe 30 yellow jackets there with perhaps another 30 supporters. They seemed to think that the media was a purveyor of fake news. The criticism may have some basis in fact but not in the way they thought. And they seemed to have a thing about socialists and think the current Government was a socialist government. I tried engaging with a few. Their beef was the Government support of the UN Global Migration Pact. I have covered the background in this post. Basically the pact is a feel good exercise that creates no binding obligations but sets aspirational goals for states to work to. But it has been converted in the minds of some into a World Government grab of our sovereignty. One of the yellow jacket wearers, who from his accent was clearly a Dutch immigrant, said that he had read the Pact and the words stating that it created a “non-legally binding, cooperative framework” but still thought the courts would use the pact to change our law. When I asked him to name one case where this has happened before he walked away. The rally was kicked off with the singing of the National Anthem in english. I was pleased that they then sung it in Te Reo. I was even more pleased that some of them knew the words in Te Reo. The movement has clearly engaged in some analysis of their messaging. They were keen to point out that they supported biculturalism, Maori and Pakeha, but were opposed to the multicultural stuff. They would be happy to have Maori rednecks join them in their struggle. They were still almost exclusively white. The speeches were an interesting collection. The first speaker went on a bit of a historical monologue and even talked about the great depression but forgot to mention the role of the first Labour Government in solving it. ACT’s Stephen Berry also spoke. The tenor of what he said is recorded in this press release. 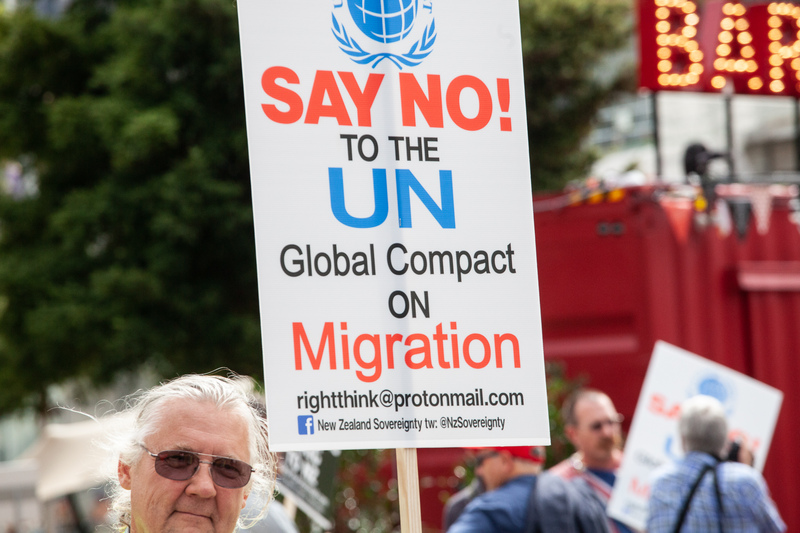 He thought that there would be a chilling effect on the right to freedom of speech if Governments engaged in awareness raising campaigns to “inform public perceptions regarding the positive contributions of safe, orderly and regular migration”. He needs to get out more. There was this continuous dichotomy about how they were exercising their rights to freedom of speech, which is a good thing, but wanted to keep the UN, which is a bad thing, out of our country because it will affect our rights to freedom of speech. They seemed genuinely surprised when I pointed out that freedom of speech was something that the UN declaration of Human Rights preserved. Marc Daalder from Spinoff has written this interesting article on yesterday’s events where he delves into the background of the groups and also discusses how local media should handle them. And he points out that in the United States after the media abandoned the traditional “he said she said” approach to reporting on Trump the media has recorded improved levels of trust. His comment about the need for vigilance is prescient. To repeat one question which I heard asked a number of times yesterday, where has multiculturalism ever worked? We were in Aotea Square. There were young Chinese and Indian, Pacifica, a mother and daughter wearing a hijab, all peacefully coexisting. Across the road there is this wonderful Turkish kebab shop. There are no less than two Sushi shops within 100 metres of where we were. Queen Street is littered with businesses owned and run by different nationalities showing the really good side of globalisation. Within the city there are plans to celebrate Waitangi day, Chinese New Year and the Festival of colours all within the next month or so. People from a variety of different backgrounds and experiences all happily living together. I am cautiously confident that New Zealand is showing that multiculturalism is working fine and that the Yellow Jackets will not gain traction. Time will tell if I am right.